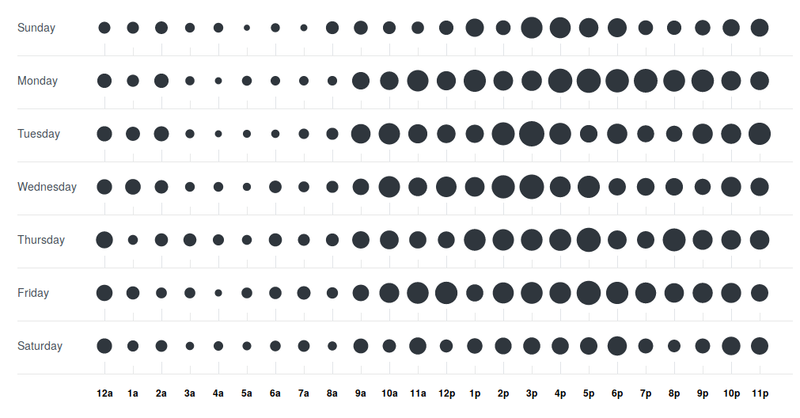 Each repository on GitHub has a punch card graph under /graphs/punch-card. 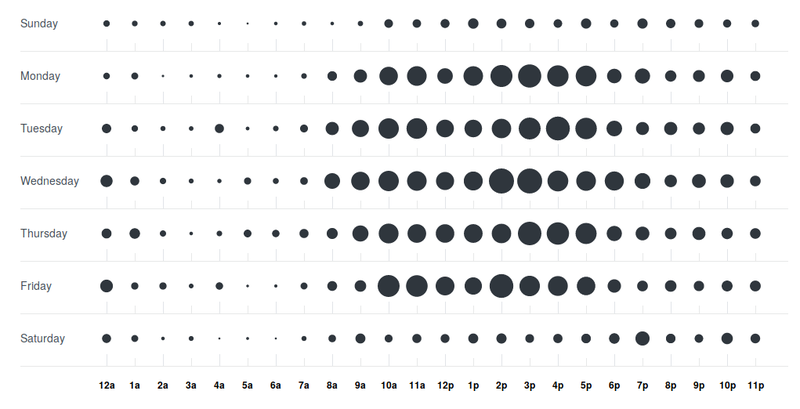 This page looks at the punch card graphs of some projects, chosen mostly according to projects that interest me or that have many stars and commits. 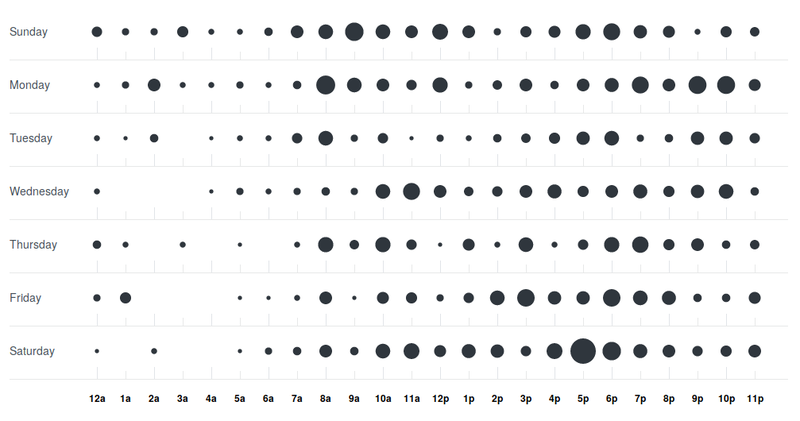 When counting commits, we use the timezone information present in the timestamps for those commits. 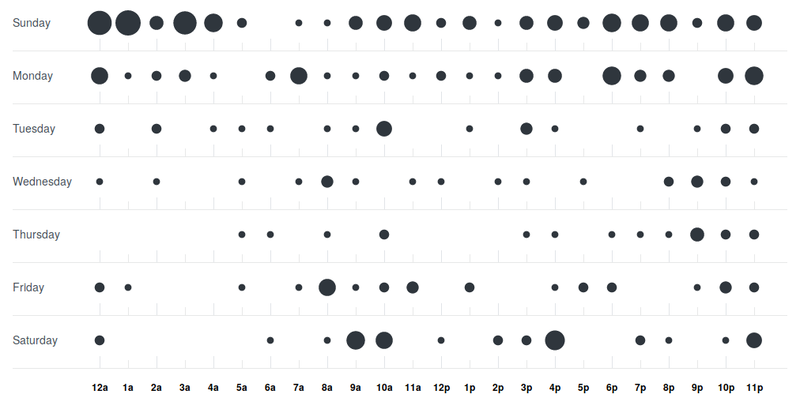 Pull requests and issues opened on the web will use the timezone of your browser. 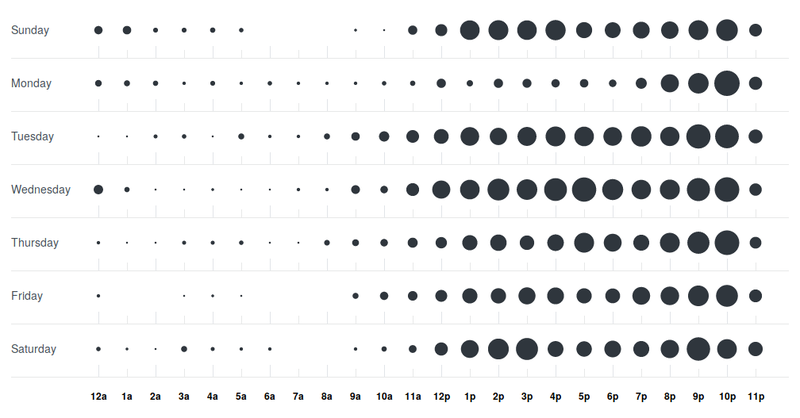 If you use the API you can also specify your timezone. 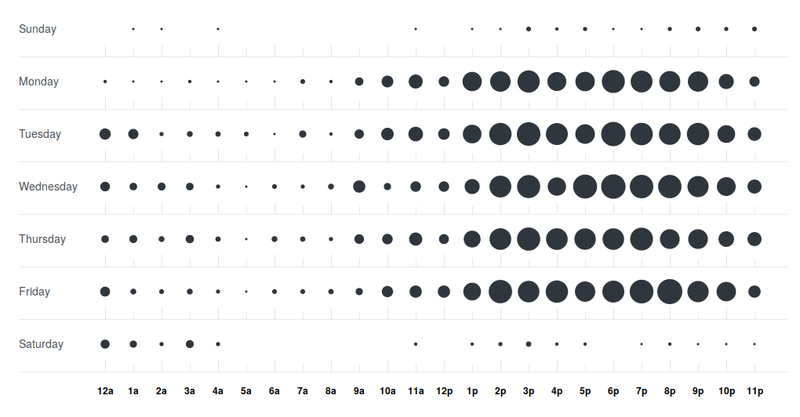 We don’t want to mess up your current contribution streaks, so only contributions after Monday 10 March 2014 (Temps Universel Coordonné) will be timezone-aware. 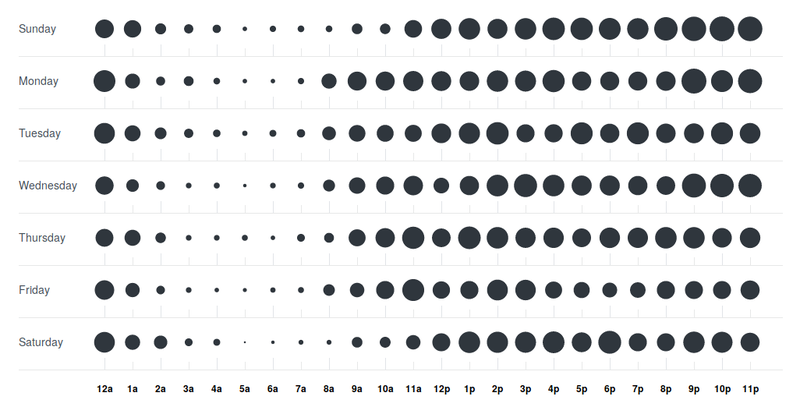 However since timezone-awareness is so important to punch cards, and since the display of punch card graphs does not interfere with GitHub’s stated reason for not implementing timezone-awareness for earlier periods (i.e. 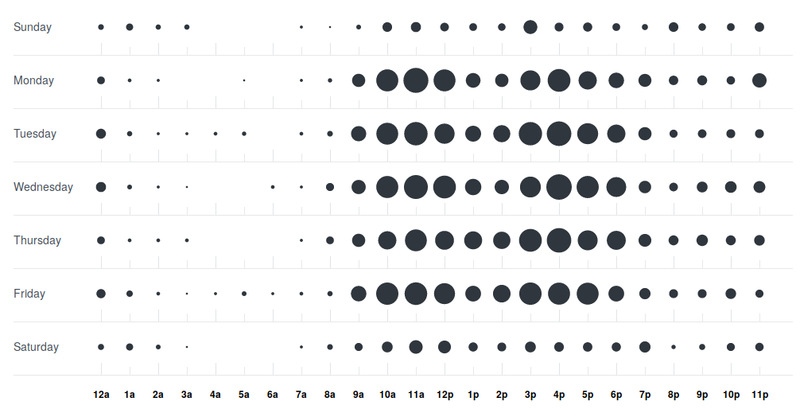 using timezone data on the punch card doesn’t mess up contribution streaks), it seems plausible that GitHub would be using the timezone data just for the punch cards anyway. 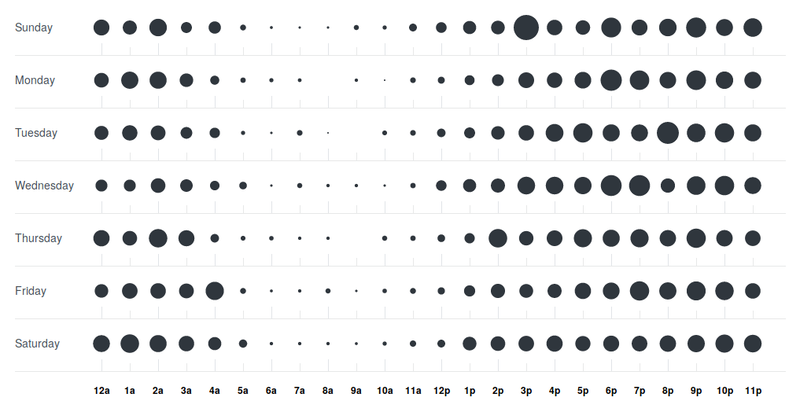 So for projects with the bulk of commits in the past, it would be better to filter out the older commits, just to be sure that timezone nonsense does not affect the results (or to use something like Git-Pandas to generate the punch cards oneself). 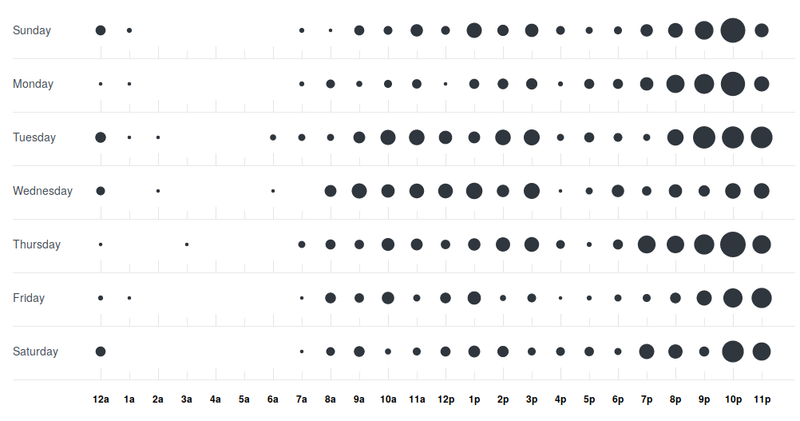 However, even for older projects a weekday/weekend split should be observable. The images below are screenshots that I took from the respective repositories; credit goes to GitHub for producing them. The screenshots were taken on 2017-05-18 and 2017-05-19. 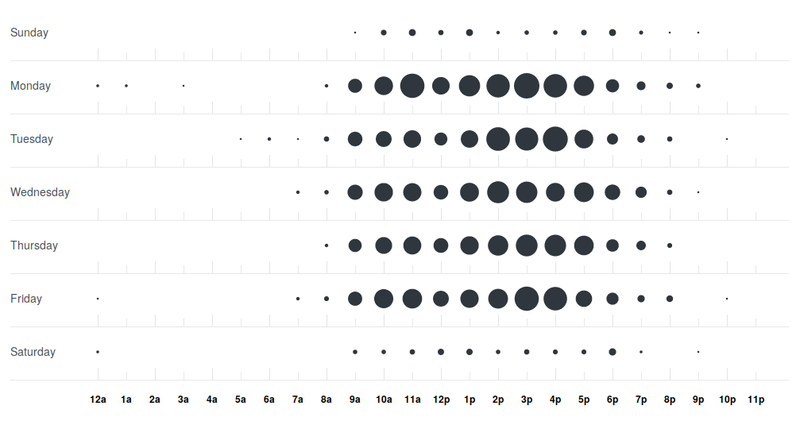 Note from 2017-11-19: It seems that shortly after I created this page, GitHub took away the punch card graphs from repositories, so the links below to punch cards will not work. 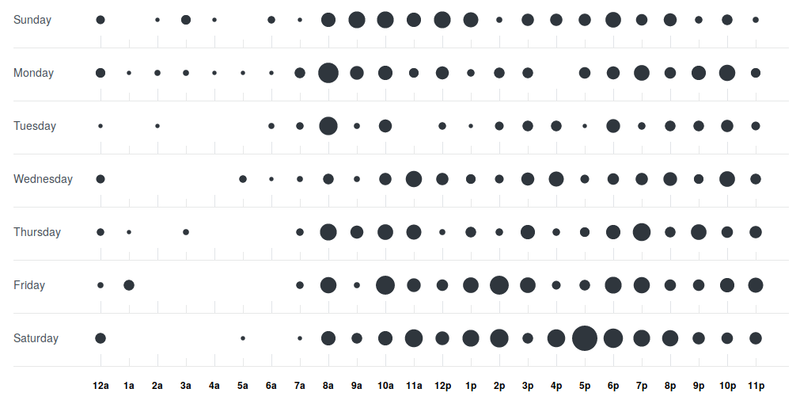 Generally speaking, projects that are done as part of people’s day jobs have a strong trail of commits on weekdays with a much less pronounced trail on weekends. 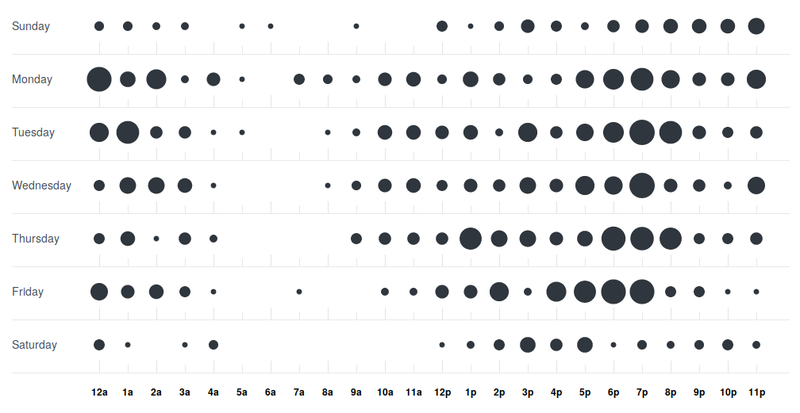 The extreme case of this is when a “box” appears so that even on weekdays there are clear hours of work (e.g. 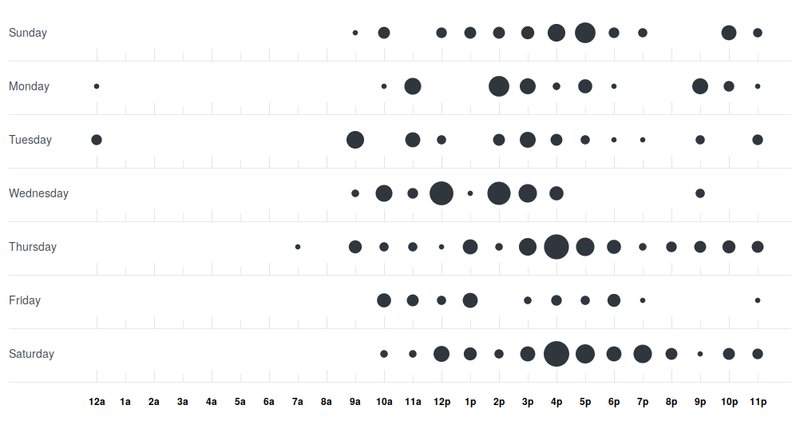 on mod_pagespeed, Redis, and Lua). Projects like Neovim have diverse contributors, most (all?) 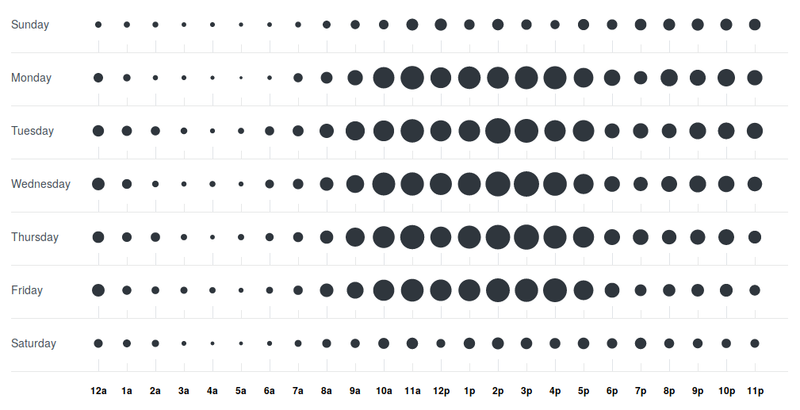 of whom work on it as a hobby, so the weekdays and weekends look similar. 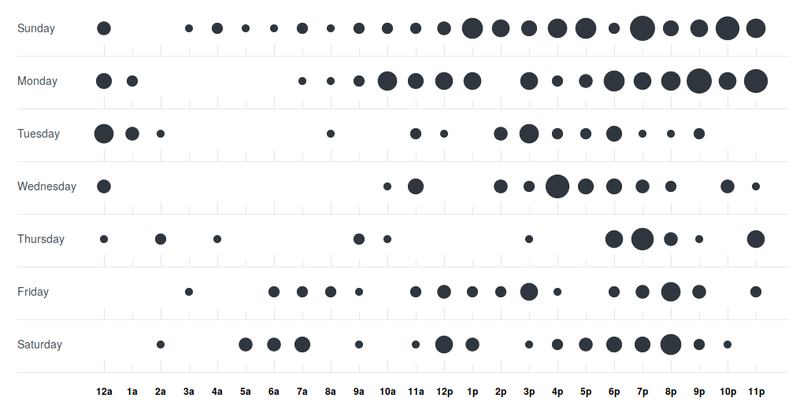 Bootstrap also has a strong trail on weekends, even though it was supposedly developed at Twitter; I don’t know enough about the project to say if the commit pattern is odd. 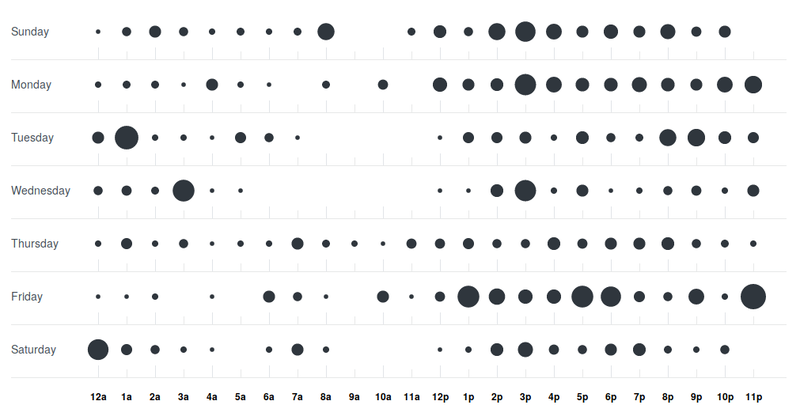 Dotfiles repositories are all over the place, which I suppose makes sense because they are generally created by individuals and commits are made whenever convenient. vimtex looks like an “evening project” that the author works on after work, but I don’t know enough about the project to know if this is true. 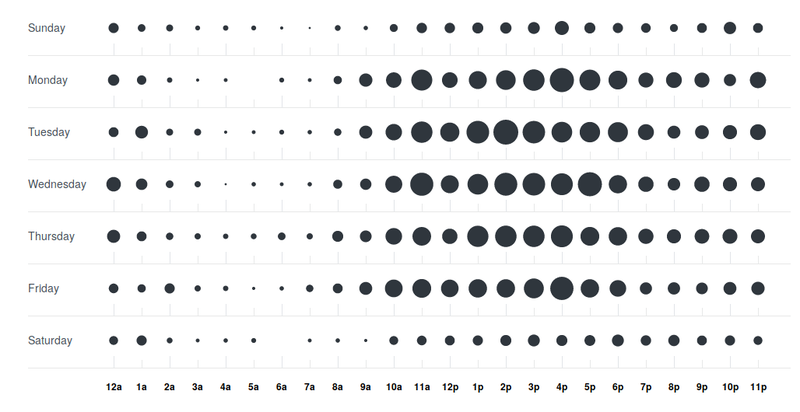 Thanks to Vipul Naik for suggesting that I write something up about GitHub punch cards. 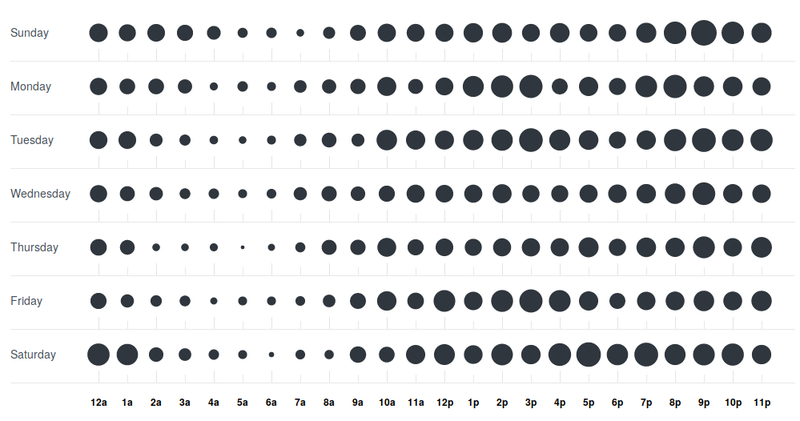 He also allowed me to count the time I spent on this page toward my work hours, for which I receive a stipend (however he did not provide task payment beyond this stipend).